Lets’s start with a brief bit of corporate blurb about Amaya Gaming. Founded in 2004, Amaya provides a range of products and services for the gaming industry that includes casino, poker, sportsbook, platform, lotteries and slot machines. They are one of the world’s largest gaming operators and their solutions power many online, mobile, and land-based gaming operations. They aim to provide their clients with a flexible platform, proprietary games and the ability to integrate with best-of-breed third party content, so that they can offer players a customized and more rewarding gaming experience. They have recently expanded further by acquiring Cryptologic, a pioneer within online casino, Ongame, a leader within online poker, and Cadillac Jack a successful slot machine manufacturer. Now the interesting bit, well for me anyway, is about their Live Casino product. They are one of a handful of suppliers of software for Live Casinos and after my research I’ve discovered that they are one of the better ones. They don’t have as much market reach as Evolution Gaming, but that doesn’t make their product any less appealing. First off I need to clear up something that was confusing me when I delved a bit into the Live Casino product. 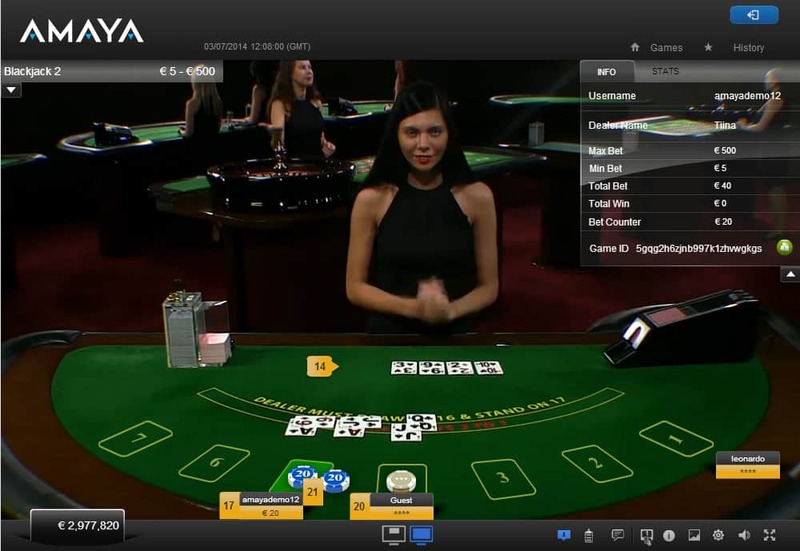 It’s quite likely that you may run across the Amaya Live Casino product and it maybe described as a Ho Gaming Live Casino. The truth is the software is by Amaya, but they have a partnership in place with Ho Gaming and together they market the live casino. The Live Casino product is comprehensive, so I’ll step through the setup and then the games that can be played. Blackjack, Roulette and Baccarat, with several variations are provided for players. This is probably the minimum that a live casino can get away with, and if you’ve been looking through live casino comparer you’ll have seen that Casino Holdem and 3 card poker are also very popular, which may be a limiting factor in players choosing to play at an Amaya Live Casino. The live casino studio is located in Estonia in a purpose built studio. It operates on a 24 x 7 basis to ensure that it is always open for it world wide customers. Real cards, tables and roulette wheels are used to deliver the gaming experience through a high quality video feed straight to players end devices without the need to download any software. The dealers are primarily from Australia, North American and Europe. They all speak English and all go through a professional training program before being allowed to deal at the tables. In fact Amaya use trainers from the land based casinos in Macau. The ability to use Magic Chips by creating custom chip values. Auto detection of connection speed to deliver optimised video feed. Games & past results can be reviewed. There is a complete player history and activity log that is easily reviewed. In Roulette, you can place crown bets, auto bet, save and reuse your personal betting strategies on future games. Baccarat can be played in 3 ways, three table baccarat where you can bet on 3 tables at the same time, Super 6 which has no commissions and Hi Rollers can play on VIP tables. In Blackjack you can Bet Behind even if the tables are full. 7 seat multi player or single player tables are provided. Each table has a complete set of statistical data available, including roads, trends and game stats which are updated in real time. No Commission Baccarat / Super 6. Player and Banker Hands pay even money unless the dealer draws a 6 where commission is paid at 1:2. Premium Baccarat which is an exclusive table option specifically aimed at high rollers. Uses 8 decks. The shoe is shuffled approximately half way through. The dealer stands on all hands of 17. Standard Blackjack rules apply based on the Vegas style of the game, i.e. the dealer is dealt 2 cards. You can Bet Behind if the table is full by betting on other players hands. A pre decision option is available so you can pre select your turn before play reaches you. This can speed up the pace of play and also allow you to play multiple tables more easily. A wait list option is available so you can be alerted when a seat becomes available when the tables are full. Double Downs and Insurance bets are highlighted when they are available. It’s European Roulette with single zero and comes with the following playing options. Autobet – a feature that allows you to bet in a chosen pattern, save it and then re-bet the same pattern for a number of subsequent hands. This is particularly useful if you like playing multiple tables or games. Leave winning chips – you have the option to leave your wining chips on the table whilst your original bet is returned to your account balance. Detailed Game stats are available, including Hot & Cold numbers, the last 14 numbers and loads more. Custom bets – As well as the regular custom bets such as French & Call, you can choose to use additional custom bets from expert roulette players. Crowning – the ability to place a bet in a crown pattern for a particular bet spot that covers the maximum number of bets for that spot. 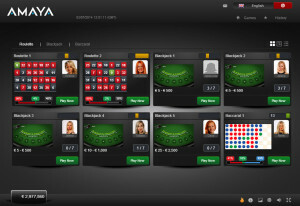 I would say that the Amaya software is one of the most comprehensive on the market and has the most betting options for Live Roulette of any of the suppliers. The next closest is Evolution Gaming. The casino has a load of options that they can use or deploy for the benefit of the player. They are all configurable, such as Fun play, but in my experience only the very common options are employed. I think this is a shame as offering fun play is a good way for a casino to introduce players to live casino without the risk to the player who can then decide if they want to play there for real money. In general the casino can customise the user interface to include branding, the live dealer content, currencies and languages offered, chip colours, time display,the number of players playing and bet limits on bet behind in Blackjack. The Amaya Software is very good with lots of options for the player. Loads of playing information is available through the stats so it’s easy to research previous play to help you decide how you will bet in the future. You will however find that because of the customisation it’s possible for different casinos to have implemented different aspects , so I’d encourage you to read my live casino reviews.